For the first time in 14 years, Tokai Univ. Hokkaido (representing Sapporo Student Baseball Association) won the first game of the Collegiate Championship. Daiko Yamane helped to beat Ritsumeikan Univ. (Kansai Student Baseball Association), one of the top contenders. Tokai Univ. 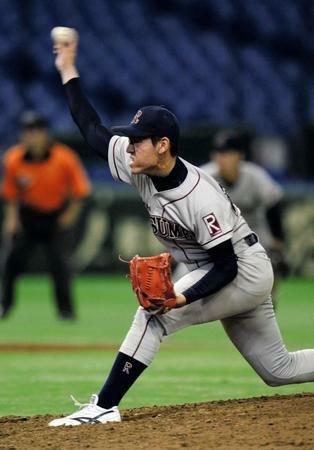 (Tohto University Baseball League), the reigning champion, was eliminated in the first round. Kogakukan Univ. (Tokai District), a newcomer, won the first victory in the national championship. The 64th National Championship in the elimination tournament by 26 Regional Champions of University Baseball Teams is being held at Meiji Jingu Stadium and Tokyo Dome for 7 days from June 8 to 14, 2015. At Meiji Jingu Stadium: Higashi Nippon International Univ. 4-7 Osaka Univ. of Sports & Science, Fukui Univ. of Technology 0-1 Kogakukan Univ., Aichi Gakuin Univ. 2-4 Toa Univ. At Tokyo Dome: Kyoto Gakuen Univ. 6-3 Ehime Univ., Tokai Univ. Hokkaido 3-1 Ritsmeikan Univ.,Tokai Univ. 0-4 Kyushu Sangyo Univ.